Microsoft is currently in the process of rolling out the USB System Update for Xbox LIVE, which will require you to quickly download the update, and then we can enjoy the extra space without having to get another Hard Drive. A quick run down of the Update once again is that up to two USB devices can be used for extra memory storage on the 360. 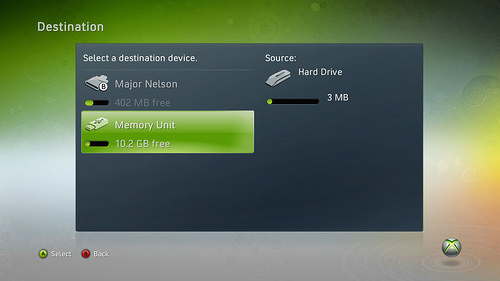 They must have at least 1 GB of Space free, and the Xbox 360 will use a mamimum of 32 GB (16 GB from each device), and any extra space on your USB can still be used for your primary uses.